Did you know that our sixteenth president had a rather unorthodox hobby, and it was really the purpose that drove him into politics and later the White House? That’s what the gonzo best-selling book Abraham Lincoln: Vampire Hunter purports. When he was talking about a house divided not being able to stand, he was secretly talking about vampires, you see. The film version, under the tutelage of producer Tim Burton, looks like it’d be an axe-swinging good time. I realize the absurdity of wishing the filmmakers had hewn closer to the source material, a radical reinterpretation of American history, but there it is. I cannot tell a lie. 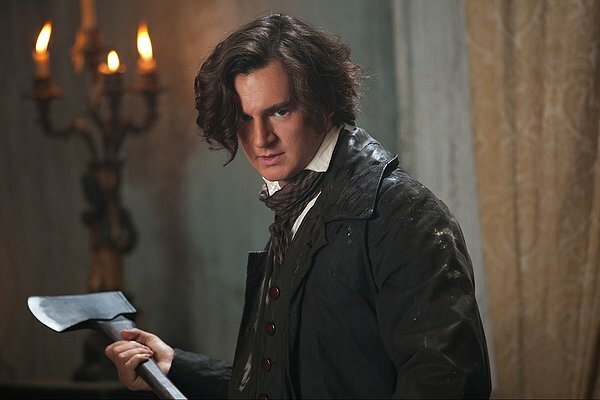 Abraham Lincoln (Benjamin Walker) is a man determined to rid this new country of the scourge of vampires. His mother was murdered by a vampire landlord, Jack Barts (Marton Csokas), when Lincoln was only a little boy. As an adult, Lincoln tries to avenge his mother’s death but Barts is too strong. Henry (Dominic Cooper) saves Lincoln and teaches him all about vampires and, more importantly, how to hunt and kill them. They strike up a partnership: Henry will provide names of vampire targets and Lincoln will dispatch them with extreme prejudice. Lincoln tries to live a solitary life but keeps building attachments; to his co-worker Joshua Speed (Jimmi Simpson), to his childhood friend Will (Anthony Mackie), who needs Lincoln’s help to forge some slave papers, and the enchanting Mary Todd (Mary Elizabeth Winstead). Abe realizes the limitations of killing vampires one by one. The vampires are exploiting Southern slavery as an all-you-can-eat buffet. 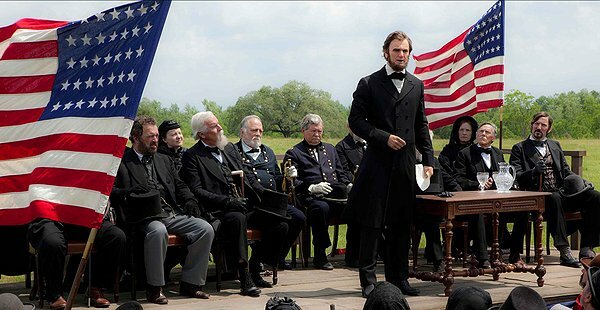 Lincoln realizes the only way to foil the vampires is to eliminate slavery, and to do so he must be in a high government position, and so Lincoln retires his axe to turn to abolitionist politics. It feels that rather than embrace the courage of its convictions, the movie is trying to please as many mass markets as possible. So many characters and storylines are inserted wholesale without any connection to the book. The film is almost unrecognizable from the book. Now, I’ll quit my bemoaning for the time being because a movie has to exist on its own merits, but Abraham Lincoln: Vampire Hunter is just a mess. As far as new characters included only to appeal to broad audiences, there’s the Black Best Friend, long a staple in movies meant to say, “Hey, our lead character is hip and has no problems with race,” but really it’s always been a depressing act of pander and I always feel sympathy for the thousands of black actors who have to compete over the limited best friend parts. Giving Lincoln a black best friend seems to remind the audience that Lincoln was against slavery, you know, in case anyone didn’t know anything about the man nicknamed the Great Emancipator. Then there’s the ascension of Mary Todd Lincoln into a feisty, strong-willed, formidable ally rather than the insular, clinically depressed woman she was in real life and in the book. Mary even gets some grand hero moments taking out a vampire in slow-mo coolness. The transformation of Mary feels just as big a pander as the character of Will. Then there’s the idea that Lincoln and his small inner circle of pals are placed in the center of action, like they alone and their heroic escapades single-handedly turn the tide of war. It’s handled so ham-handedly that it all plays out like they’re the Scooby Doo gang solving the Case of the Vampire Insurrection. Lincoln’s history is given such shrift attention, just enough to fill out the standard tortured hero’s backstory for the aims of the story. We see Lincoln as a child but just enough to establish his tragedy and hunger for revenge. Then we cut to him as an adult and going to kill Barts. That’s quite a big leap in time with little careful setup. The time before Lincoln’s presidency is just enough to supply him with a stock character posse and a plucky love interest, and then it’s right to the Civil War. So much time in between the main events just gets squeezed out, and so Abraham Lincoln: Vampire Hunter feels like it’s always one scene away from a clumsy montage. The vampire threat, as presented, also feels too insurmountable. Not only can these vampires walk in the daylight, they’re super strong, super fast, and can make themselves invisible, a neat new trick. When they ally with the South they seem nigh unbeatable. The movie makes the mistake of making the adversary seem too powerful, so the eventual thwarting of the vampire Confederacy feels too easy and far-fetched given the magnitude of the threat. Adam (Rufus Sewell) is hinted at being like the first vampire, but then this idea is never picked up again. Why even hint at something significant if you have no intention of pursuing it? There’s another new wrinkle where vampires are incapable of killing their own kind. If this is the case then why aren’t the vampires turning every single person they can find into vampires? It shores up their side and guarantees less potential people that could kill them. I’m curious how certain swaths of southerners are going to react to seeing their beloved Confederacy teeming with devilish creatures. Then again, I think the romanticism of the Confederacy is hogwash. When insurrections win we call them revolutions of independence, and when they lose we call them treason. Guess what? The South lost. As much as I enjoyed his book, I have to lay the blame at the hands of Seth Grahame-Smith, who adapted his book into the screenplay (he’s 0-2 this summer after his disastrous screenplay for the other vampire movie this summer, Burton’s Dark Shadows). Granted, I’m sure he got intensive notes on how to alter his story for the big screen; the whole projects reeks like it had too many cooks in the kitchen. The interconnection from the book, finding clever ways to marry history and alternative history together, have been ground down to stream line Lincoln into an American super hero. Not only is he handy with an axe, this Honest Abe can leap from racing horse back to racing horse back, and even get clobbered by a horse and keep on going. The coda at the end feels like a missed opportunity to carry on the Lincoln tradition into our modern age. With the clever reworking replaced by blockbuster superficiality, the film merely takes history and has it perform the outrageous rather than finding smart ways to connect all the outrageousness to the established facts. What the movie has to the credit of director Timur Bekmambetov is a strong visual pulse. Bekmambetov directed 2008’s testosterone-soaked Wanted, so you know you’re going to get some crazy and eye-catching images on display. The action sequences do pack a punch and I’ll admit that seeing an axe utilized as an inventive martial arts weapon is considerably cool. There are two standout set pieces. The first is a fistfight between Abe and Barts in the middle of stampeding horses. You feel right in the thick of the action, horses stampeding all around, the sun setting to offer an eerie yet beautiful glow to the ordeal. It’s one of the more reality-stretching moments, as I noted above, but man if it isn’t thrilling and lovely to watch. The other standout sequence is a climax aboard a speeding locomotive itself atop a large wooden bridge engulfed in flames. Abe and Will stand back to back, swapping the axe to kill vampires, and then hey have to outrun the collapsing train. In these moments, the movie is joltingly alive, bursting with excitement and that rare yet glorious feeling of watching something beautifully different. I just wish this sensation wasn’t so fleeting in the movie. Abraham Lincoln: Vampire Hunter is a violent historical reworking that isn’t good enough to be properly entertaining and it isn’t bad enough to be considered camp. The film is mostly disappointing because it should feel far more engaging given its whacked-out premise the very cheeky promise of its title, and strong source material, a pulpy, ripsnorter of a read. The movie has some stellar standout moments but I think what ultimately hinders the entertainment value is how dumb everything comes across. This is not dumb in the winking, self-aware, satiric sense, but dumb in more of the blockheaded, Michael Bay, formulaic blockbuster sense. I wouldn’t even classify this movie as an enjoyably dumb, a silly summer slice of escapism like Battleship, which is looking better every week after new, disappointing summer releases (and it’s not even July yet!). The spirit of this movie is missing, the cleverness of the conceit drained, and the fun is bottled up. What this movie reminds me of is the stupid 2003 film The League of Extraordinary Gentlemen, which took classic literary characters and threw them into a genre movie. Both movies figure the exercise alone, seeing classic literary or historical figures in absurd contexts, was enough to justify entertainment. I say that you have to work harder. Posted on June 25, 2012, in 2012 Movies and tagged abraham lincoln, action, book, mary elizabeth winstead, seth grahame-smith, slavery, supernatural, tim burton, Timur Bekmambetov, vampires, war. Bookmark the permalink. Leave a comment.